A forecast of force 5 and rising deterred many of the regular visitors to Dell Quay SC for the 2000 class open meeting on Sunday 11 June. 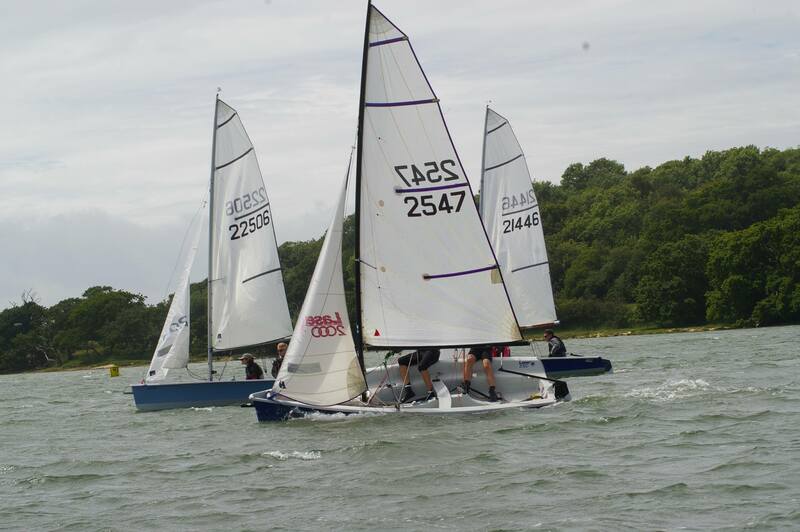 Despite the forecast of rather too exciting conditions, 5 boats took to the water for some closely contested racing. Race officer Steve Sampson set a windward / leeward course with a gybe mark set just off the Dell Quay balcony – just to add spectator value. The spectators weren’t disappointed. In race 1 visitors Guy Russell and Clare Collett (WWSC) diced with Dell Quay sailors Graham and Fiona Dalton. Fiona had been promised a gentle force 3 to entice her onto the water, and was heard questioning quite what type of force 3 this was with white horses rolling up from Itchenor reach? After swapping the lead a few times the Daltons hove to in order to reassemble the main sheet block, letting Warwick Hoddy and John Denyer slip by to secure second place. A quick turn round for race two saw a familiar battle for the lead spot, with Russell / Collett narrowly defeating the Daltons to claim first place and overall victory in this best of three event. 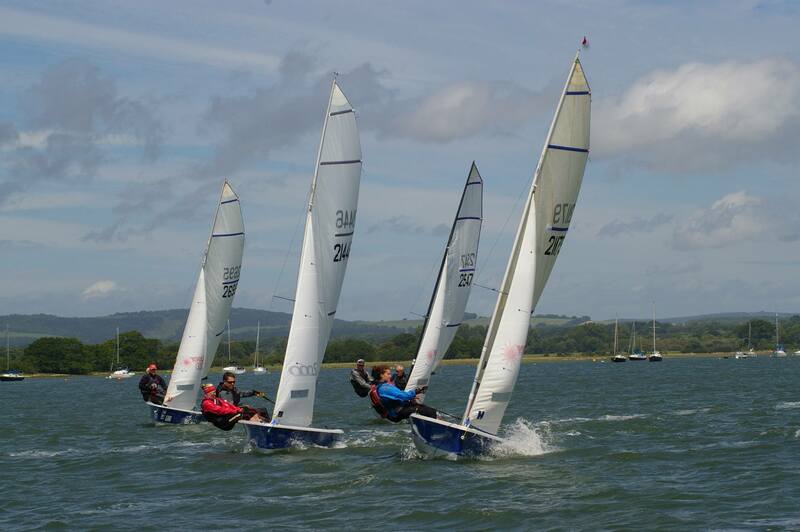 Third place went to father / daughter crew of Peter and Charlotte Binning, while Hoddy and Denyer sat out the final lap after a spectacular leeward gate capsize. Meanwhile RS400 sailor Rob Corfield crewing for Chris Campbell demonstrated spectacular capsize skills in a boat that proved to be rather more exciting than he expected. Russell and Collett secured their overall victory with another first in the rising winds of race 3. The Daltons decided that marital harmony was best served by a dignified retirement, though not before some blisteringly fast downwind planing legs, handing second place overall to Hoddy and Denyer and dropping to third. The Binnings took fourth overall, and earned a special endeavour award for rising to what turned out to be a great challenge.